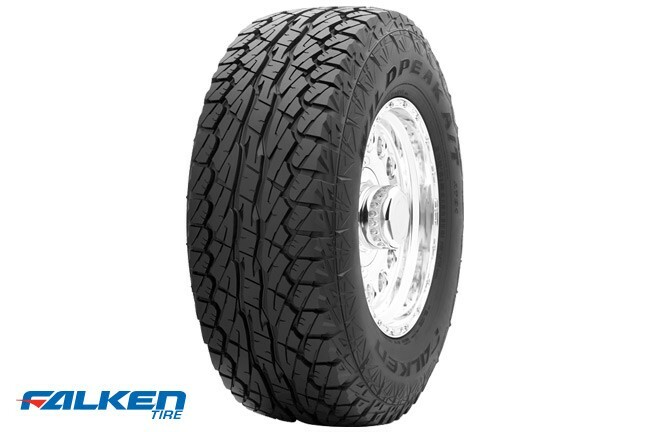 The WILDPEAK A/T reinvigorates the all-performance sport utility and light truck tire market through its aggressive stance for maximum traction. A symmetric five-rib pattern and rigid block design allows for ultra durability, exceptional on-road response and optimized off-road handling. Two stiff, extra-wide steel belts enable stability, while four wide, multi-angled grooves enable maximum water, mud and snow evacuation, and biting block edges provide unparalleled traction and control. Long sweeping sipes provide a multitude of biting edges for additional traction and ride comfort. Variable block shoulder design reduces tire noise while maintaining an aggressive look. Open shoulder grooves effectively disperses water and debris in all weather conditions for both on and off-road. Square shoulder profile features an aggressive stance and maximum traction. Joint-less nylon band provides first class ride comfort. Hard bead apex provides sidewall stability. Two stiff, extra-wide steel belts for stable on and off-road handling. Four wide aggressive multiangled grooves allows for maximum water, mud and snow evacuation while aggressive biting block edges provide unparalleled all terrain traction.